Our next Docklands Networking Event hosted by our friends Google on Friday 26th October. Dr. Diarmuid O’Brien, Chief Innovation and Enterprise Officer at TCD, has kindly agreed to present to us on Trinity’s €1 billion plans for a Grand Canal Innovation District centred on a new campus in the heart of Dublin’s Docklands. 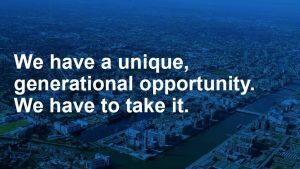 Trinity believes Ireland has the critical mass needed to create a world-leading innovation district right here in the heart of Docklands. TCD’s proposed Innovation Campus will shift a significant amount of enterprise-based activity to newly built facilities on the site of the old Pearse Street Enterprise Centre. 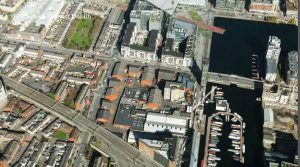 The proposed site is boarded by Pearse St., Macken St., Hanover Quay and the railway line. This Docklands Network Event is kindly supported by our other friends; AIB Docklands. This is an open event but with limited capacity so all attendees must book on our Eventbrite page here. On the day registration will begin at 7.30am. The event will conclude by 9.00am.